Over eighty rare and unseen photographs from behind the scenes, as well as cast portraits, from the opera Four Saints in Three Acts comprise the exhibition 4 Saints in 3 Acts—A Snapshot of the American Avant-Garde currently on view at the Photographers’ Gallery in London. The exhibition sheds light on the insights of a controversial and ground-breaking operatic work that was first performed at the Wadsworth Athenaeum in Connecticut on February 7, 1934, which almost instantly made its way to Broadway’s 44th Street Theatre. Its libretto was written by influential modernist novelist, critic, playwright, and collector Gertrude Stein with a score by composer Virgil Thomson. The premiere coincided with Picasso’s first retrospective in America at the same venue. The innovative and fresh approach towards the conventional structure and theme of the opera as a form of artistic expression for theatrical performance and music was the key factor for its tremendous success. 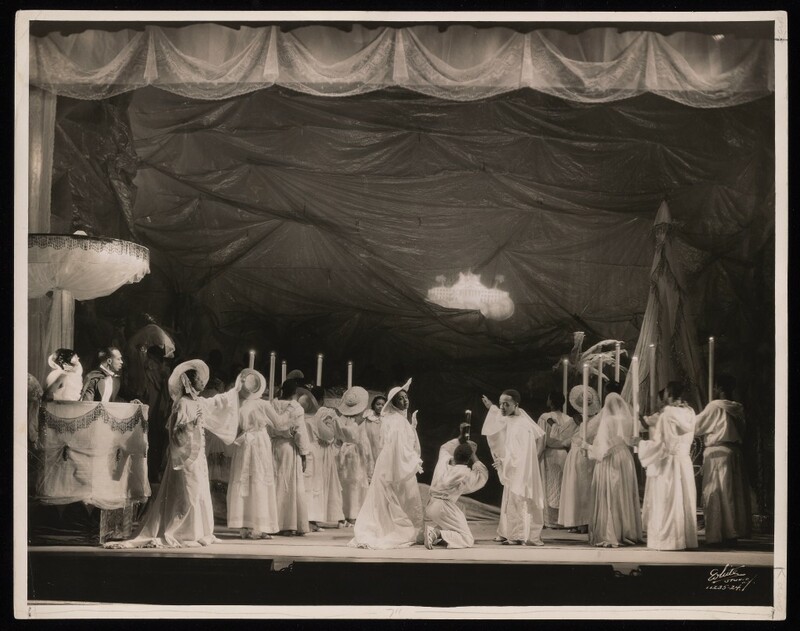 This was utilized through the engagement of an all African-American cast, outsourced from the nightclubs and choirs of Harlem under the coordination of choral conductor Eva Jessye, an influential figure of the Harlem Renaissance who was also involved with George Gershwin’s opera Porgy and Bess a year later (1935). An array of sought-after artists were also associated with the production, such as British ballet dancer Frederick Ashton who undertook its choreography, and surrealist artist Florine Stettheimer, who created the sets, applying the use of cellophane in numerous inventive ways and costumes made of silk, lace, and taffeta. Photography, which is the focal point of this show, was a paramount aspect in the documentation and creative process of a production of such caliber. 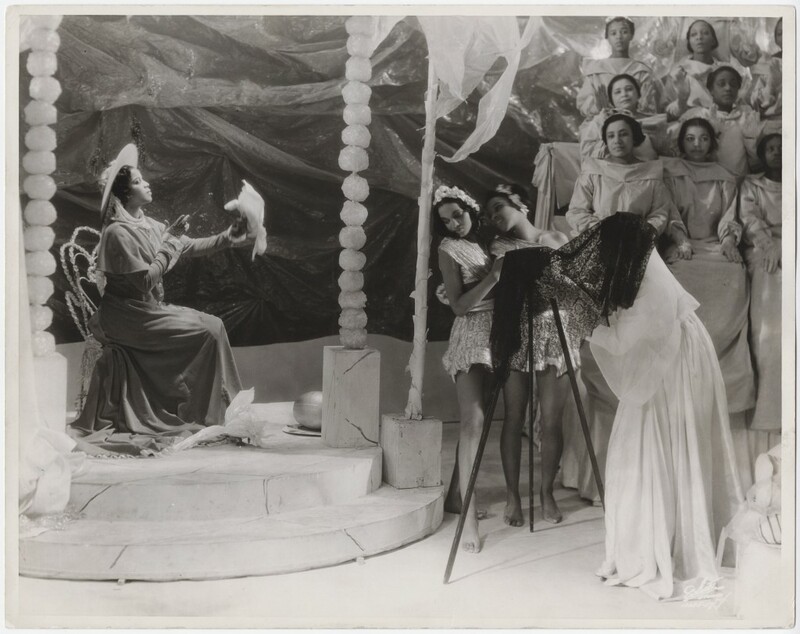 A number of professionals, including fashion model and photographer Lee Miller, writer, photographer and patron of Harlem Renaissance Carl Van Vechten, fashion photographer George Platt Lynes, and war photographer and publicist Therese Bonney were all heavily involved in the development of Four Saints through their expertise in capturing members of the cast and producing behind the scenes and stage shots. The huge success of Four Saints was due to an enthralling amalgamation of elements. Its mock religious theme embracing two 16th century Spanish saints, Ignatius of Loyola (founder of the Society of Jesus, alias Jesuits) and Teresa of Avila, as well as other invented spiritual figures such as St. Settlement, St. Plan, and St. Plot, indulged people in a fantasy world filtered through a captivating sense of humor. The representation of European saints by an all-black cast, the employment of surreal locations for several scenes—such as a cathedral, a garden, and a mansion—paired with the inimitability of Stein’s libretto, which placed more emphasis on the value of words and their sounds, conquered the audiences despite the sense of division among the critics. Four Saints undoubtedly reflected a social experiment conducted by Stein and Thomson conveying provocative ideas of its time. It references the societal dissonance that characterized the interwar period in North America, resulting in the growth of the middle class, the reassessment of racial inequality, and the politics of space. Emphasizing both the Queer and Black avant-garde, Four Saints offered the unique prospect to art enthusiasts and curious alike to delve into notions of contemporary realities, and perhaps discover unknown to them practices and artistic disciplines that gradually became popular in America towards the second half of the 20th century. The revolutionary hypostasis of this performance embodies a criticism which was vital not only for this particular moment of time but also for the decades to come, synchronously maintaining a sense of timelessness that is still pivotal when attempting to study and understand modern art and modernist aesthetics of America during the first half of the 20th century. The archive material on display at the Photographers’ Gallery proposes a great opportunity to rediscover the roots of avant-gardism almost a century later, and explore its trajectory throughout the decades, leading towards new practices in contemporary art. 4 Saints in 3 Acts – A Snapshot of the American Avant-Garde runs at the Photographers’ Gallery, London, UK through February 11, 2018. Dr Kostas Prapoglou is an archaeologist-architect, contemporary art writer, critic and curator based in London, UK and Athens, Greece. January 30, 2018 | Filed under Art Seen: International and tagged with 4 Saints in 3 Acts, American Avant-Garde, Avant-Garde, Kostas Prapoglou, London, Opera, photographers' gallery.